In a nearly forty year publishing career Steinbeck wrote fiction and non-fiction offering a wide range of subjects and settings, including the Soviet Union, marine biology, and French politics. He bristled at being pigeonholed by The Grapes of Wrath and his other set in California social commentary novels of the 1930s -- Tortilla Flat, In Dubious Battle, and Of Mice and Men. Steinbeck biographer Jay Parini writes that East of Eden "an ambitious book with deep flaws. In retrospect, it seems a pity that Steinbeck lacked firm editorial guidance and the patience to see the book through several stages of revision. The right kind of pruning (getting rid of the Hamiltons altogether, for example) would have made a vast difference to the book's symmetry, and the stylistic excesses might easily have been trimmed. But the novel somehow survives its flaws, and it represents a shift in Steinbeck's thinking about the role played by the individual conscience in a fallen world. American literature would certainly be poorer without it." East of Eden stayed on the New York Times top ten fiction list until late May 1953 when it dropped out to help make room for new titles such as Ernest K. Gann's aviation suspense tale The High and the Mighty and The Echoing Grove, about life in modern London, by Rosamond Lehmann. Steinbeck's work on East of Eden (originally titled The Salinas Valley) was delayed by his writing the screenplay to director Elia Kazan's film about revolutionary Mexico, Viva Zapata! (1952). 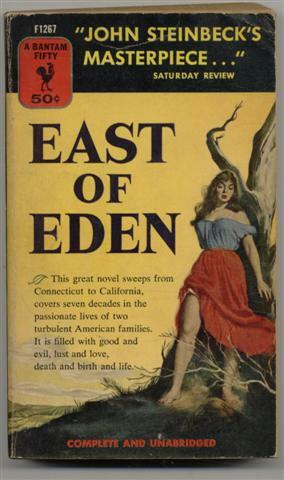 Kazan read East of Eden before it was published and immediately proposed doing a screen version. According to film historian Terry Ballard, Kazan and Steinbeck drew up an outline then agreed to have playwright Paul Osborn, a specialist in adaptations, write the script. 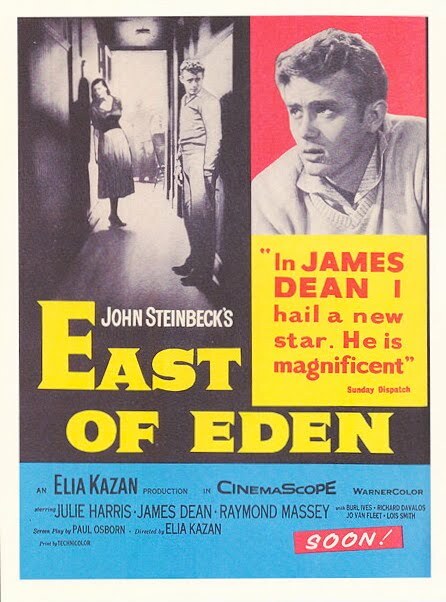 Kazan's film of East of Eden was released in early 1955 by Warners Bros. The film omits approximately the first two-thirds of the novel and concentrates on the character of Caleb "Cal" Trask, a brooding Salinas Valley farm boy in the early twentieth century. The film was a vehicle for rising young actor James Dean who died in September 1955. 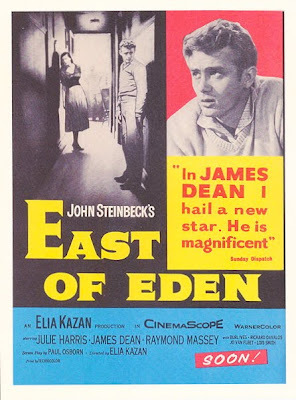 East of Eden was the only one of Dean's three major films (another being the movie version of Ferber's Giant) released before his death. Kazan's film got a warmer critical reception than Steinbeck's novel received. Steinbeck himself wrote -- "[I]ts's a real good picture. I didn't have anything to do with it. Maybe that's why. It might be one of the best films I ever saw." After East of Eden, Steinbeck wrote only one major work of fiction, The Winter of Our Discontent (1961), about a Long Island grocery clerk who abandons his principles in an effort to regain his family's lost wealth and status. "The Winter of Our Discontent brought to an end Steinbeck's career as a novelist for various reasons," writes biographer Parini. "Ill health was the crucial factor behind the decision not to write more novels: He was just not feeling well...He found himself less steady on his feet and unwilling to work long hours in his study. There was also a general feeling of disappointment over the critical response to Winter...He was bone-tired of having each new book weighed, unfavorably, against The Grapes of Wrath, and had lost patience with the inevitable rejoinder, Whatever happened to John Steinbeck?" In 1962, Steinbeck became the seventh American to be awarded the Nobel Prize for Literature, following Sinclair Lewis, Eugene O'Neill, Pearl Buck, T.S. Eliot, William Faulkner, and Ernest Hemingway. Only two Americans -- Saul Bellow and Toni Morrison -- have won since. In recent decades some critics have reassessed East of Eden, with its blend of reality based and wholly invented characters, as an early experiment in post-modernism and metafiction. A musical version of East of Eden called Here's Where I Belong, with music by Robert Waldman and lyrics by future Pulitzer Prize winning playwright Alfred Uhry (Driving Miss Daisy) had a short run on Broadway in March 1968. Another young playwright who would go on to renown in the American theater, Terrence McNally (Master Class, Frankie and Johnny in the Clair de Lune) worked on the musical's book but asked that his name be removed from the credits. McNally was personally acquainted with Steinbeck. Not long after graduating from college in the early 1960s, McNally was employed as a tutor and companion to Steinbeck's sons during a lengthy Steinbeck family trip to Europe. Steinbeck died in New York at age sixty-six in December 1968. Look for "Bestsellers List Revisited -- Holiday Season 1952 (part 2) Non-fiction" coming soon! Center for Steinbeck Studies (San Jose State University). National Steinbeck Center (Salinas, California). Steinbeck: A Life in Letters. Edited by Elaine Steinbeck and R. Wallsten, 1975. Benson, Jackson J. The True Adventures of John Steinbeck, Writer. 1984. Parini, Jay. John Steinbeck: A Biography. 1995.